A complete materials kit (patterns sold separately) to make all of the ornaments in The Twelve Days Ornaments series is now available! Easy to do with basic hand sewing experience. The third set in the series of Twelve Days Ornaments is now available. This is a great time to get started on this adorable project. With a little basic embroidery knowledge and experience, you can make these! The second set in the series of Twelve Days Ornaments is now available. Stitch them up in time for Christmas! A wall of color... it makes me happy. My very own wool felt stitchery shop - If you are ever in southeastern Michigan, I hope you will come visit! A pile of wool felty goodness! Real Wool Felt: This is the GOOD stuff! The stuff of your dreams! Way back in 1998, I had the pleasure and good fortune to meet some ladies from Europe who were stitching tiny little stuffed animals for their children from a beautiful felt fabric the likes of which I’d never seen before. To this day I still recall, with great clarity, my ‘AHA!’ moment upon discovering this felt. Oh my goodness. It was simply…. well… delicious! Eye candy for sure. The color. The texture. The weight and the hand. The European ladies laughed as I exclaimed my enthusiasm and curiosity and peppered them with questions. Pure merino wool felt – yes! 100% merino wool! I had to know where it came from. I wanted to know why I’d never seen such a fabulous felt. I wanted to know why it wasn’t being sold here in the USA. And I wanted that felt to be mine. Every single solitary color of it! My simple little discovery that day led to quite an interesting quest for me. I began researching wool felt. 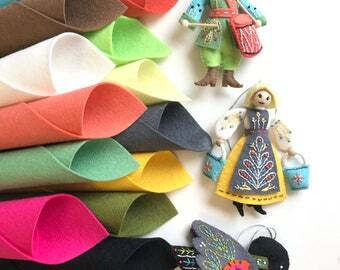 I researched the historical significance and the cultural impact of wool felt. I collected and compared wool felt from all over the world. I made amazing connections with people in countries I’ll most likely never visit. It’s been an incredible journey with lots of humbling life lessons along the way. Researching the history of wool felt led to a greater understanding of art and craft in other parts of the world. It led to an enlightening realization about just how young our USA really is in comparison to Europe and Asia and how our own culture is largely driven by manufacturing and ready-made. It is inspiring for me, personally, to make available this truly environmentally friendly, toxin-free, high quality, pure wool felt that simply begs to be crafted into something wonderful. I've often said that selling this merino wool felt is similar to a performing a public service or an act of kindness! I didn't decide to sell this wool felt because I wanted or needed a job... My motivation was to share this valuable resource with other like-minded artists and crafters who appreciate the best materials and understand that when you commit your time and talent to a project, it makes sense to invest in quality. I live in Michigan, not far from where I was born. I've always loved the process of making things... the spark of an idea, the hunting and gathering of supplies... the seeking of knowledge... the experience of creating. Welcome to Felt On The Fly and thanks for visiting! You're going to love this high quality wool felt. This really is "The Good Stuff"! If you've tried wool-blend felts before, you'll be amazed at the difference. Seeing and feeling is believing. Environmentally friendly processing and certified safe dyes make this wool felt softer and user-friendly. Tested and certified as safe for children. See more details below. I'm happy to take custom requests. Just convo me (sign in to use this feature) with your color request and/or ideas (or contact me directly through e-mail at feltonthefly [!at] comcast.net) and I'll be glad to work with you. I can match anything you'd like. Send me a scrap of fabric or whatever you'd like to match, and I'll suggest colors and options.